Let's face it, boosting you follower count on Instagram can be hard. It doesn't matter if you put the best content out there, if you don't get any eyeballs on it, it isn't much use. It takes consistent effort and, sometimes, a little bit of luck to boost your profile to the next level. Everybody has to start somewhere and we're all constantly looking for ways to improve our reach, up our engagement and stand out from the crowd. So what if there was a way to game the system? 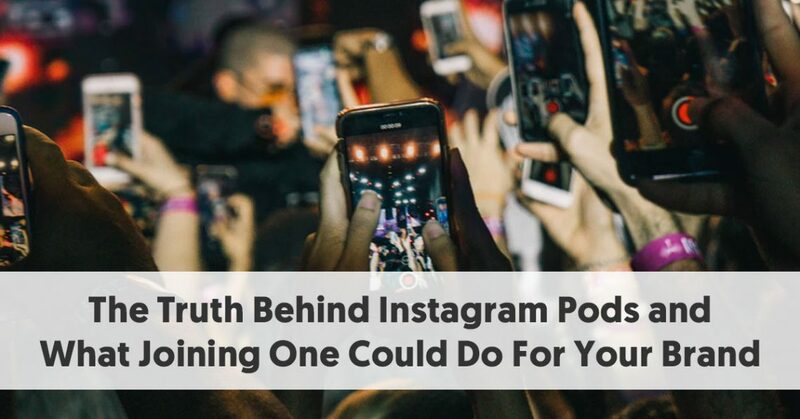 Instagrammers have found a way to do so by joining and taking part in Instagram pods, secret communities that help each other in a way that tricks Instagram into thinking you have high engagement so that it gives your profile more exposure. Instagram pods have for a few years now been extremely popular and have distinct advantages. But it also has downsides and can work to your disadvantage. Here is a deep dive into the world of Instagram pods, including the rules of engagement and the pros and cons of joining a pod. Why should you join an Instagram pod? How do you join an Instagram pod? Where do you find pods? Will joining a pod increase your reach and engagement? Are Instagram pods something brands should consider? An Instagram engagement pod is a group of users who cluster together in group chats or forums where users indicate to the rest of the group that they have just posted a photo or video on Instagram. The other users in the 'pod' will then go like, comment, follow or share your post to help each other increase engagement on their content. When a user posts the content, everyone in the pod is alerted to it, and the post is then flooded with likes, comments and engagement. In turn, other Instagrammers who aren't in the pod are more likely to engage with that post; seeing that it's so popular and everyone else is presumably jumping on the bandwagon. A pod can be many sizes and not all pods are created equally. There are pods with more than 1 000 active participants, and pods that have 100 or fewer active users. The big ones, while easier to join, can give your profile an unrealistic sudden boost, which also means Instagram will catch you out (more on that later). The smaller pods are harder to join but can yield really good returns. Whether you're looking for a pod with a general focus, or something exclusive, chances are pretty good that there's a pod out there to cater to your needs. A while ago, Instagram changed its algorithm from showing content in the chronological order it was posted, to highlighting posts it thinks you'll want to see based on your past behavior. Importantly, the algorithm also places a premium on content from accounts that already have high engagement – both in your feed and on your explore page. This change in the algorithm has made it very hard for brands and users to build engagement and followings on Instagram. So, to get around it, Instagrammers decided to work together to trick the app's algorithm so that their posts show up more in the feed of their followers. By liking and commenting on each other's content, they signal to Instagram that their content is engaging. Thus, their content gets served up to more of their followers. These pods are seen as an attractive and easy way to increase your numbers. There are many places you can find and join pods, but some are harder to join than others. There are the mass pods that have 1 000 members plus and are relatively easy to join. Smaller, more niche pods can have as few as 20 people in them, and they are much harder to find and join. 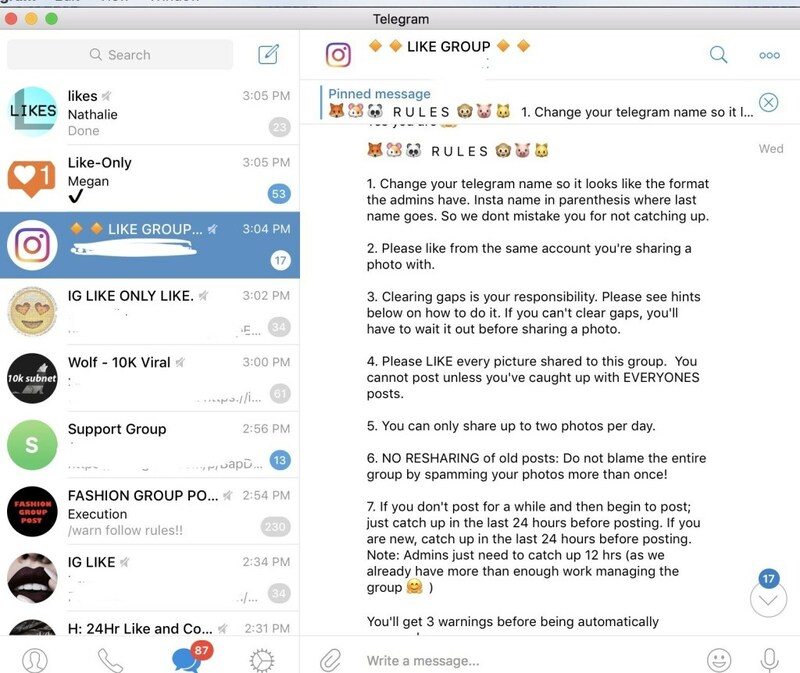 Most of the mass pods can be found on Telegram Messenger. It is a cloud-based instant messaging service, where users can send messages and exchange photos, videos, stickers, audio and basically any type of file. What makes Telegram a popular platform for pods is that it places no limits on the size of media and chats you can post. You can also create chat groups of up to 100 000 members and don't need to have all those participants in your contacts. This makes it the perfect platform for mass pods. People can be added to a Telegram Pod by their Telegram username (handle), or they can be invited to the group with a telegram group chat link. Many pods also exist on Facebook. These can be harder to join as they are mostly closed and require an invitation from the admin to become a member. Your content will also be vetted before you're allowed to join the pod. Facebook pod groups won't generally exchange their Instagram content on Facebook itself. Seeing that Facebook owns Instagram, users don't want to do anything that flags their presence as users who are 'gaming' the system. Reddit is almost the easiest place to find any pod you might want to join. 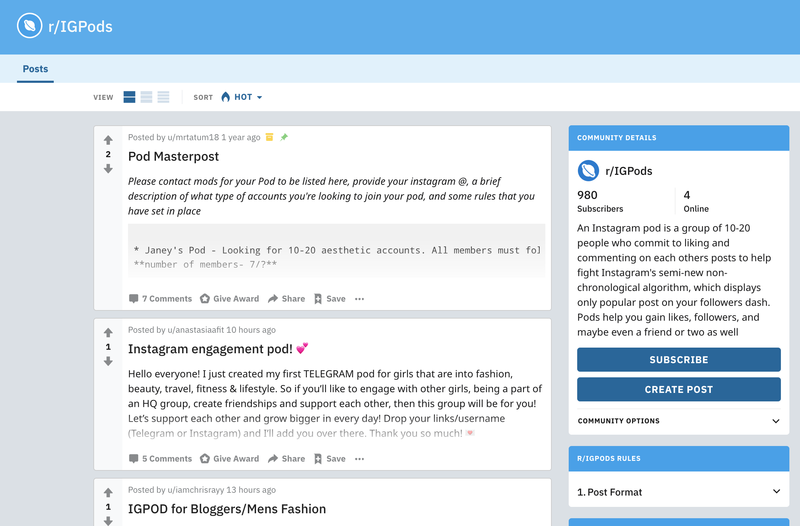 It has a subreddit called IGPods where there are pods calling for members. You can also start your own pod and call for members on Reddit. The pods themselves mostly exist in Instagram's messaging system. The way it works is that members will message the group to say that there is new content on Instagram. The rest of the pod will then go and like and comment. Of course, there are pods that also exist on Instagram itself. However, in order to avoid being caught out, these groups are super secretive and hard to find. It's all about knowing the right people and dropping subtle hints to let them know that you want to join the pod. Once you've joined a pod, there are a host of rules you have to adhere to. While every pod has its own set of specific rules, most follow the same general guidelines. Generally, you would post the link to your Instagram posts that you want members of your pod to like or comment on in the group. When other members see the link, they would go do that. Some pods also use a code word, which would be the sign for members to go to your Instagram profile and like the latest post. As a member of the pod, it is also your job to go like or comment on all the previous links on the pod from the members of the pod. Every pod may have a different policy on how you should be catching up, for example, the previous 20 links or past 24 hours' links, etc. Some pods have predetermined time slots that users have to share their content after which other members have a certain amount of time to go like or comment on those posts. Of course, the bigger your pod, the more posts you'll have to engage with, which can become quite a tall order. As a member of the pod it is very important that you respect the time that the pod 'drops' new content, otherwise you might get kicked out. Another thing that will get you kicked out of a pod include chatting in the group (this is not a social group, it is there for business purposes). Some pods will only allow you to join if you have a certain number of followers, and will first verify the type of content you post (e.g. travel, photography, food, etc. ), and how much time you have to fulfil your engagement requirements before they let you in. The main benefit and purpose of joining an Instagram pod is to encourage users that normally wouldn't engage with you, since the appearance of people liking your content helps make it easier for others to do so. The mass-pod will give the number of likes your posts receive an instant boost but small pods, or niche pods, offer a much more genuine engagement experience. Some pods are groups of friends, some are complete strangers and many of them could be open to giving you tips on your content if you're in a pod of like-minded social managers. The opportunity to engage and meet creatives from all over the world could be very rewarding. The downsides might actually outweigh the upside. Chances are if you suddenly get a big boost in likes and followers, Instagram, who are always on the lookout for users trying to game the system, might catch on. Even a novice could figure out that your likes are artificially induced if you only have 100 followers but your post receives thousands of likes. It may also annoy your real followers who are looking for an authentic interaction, or recommendations from an influencer they can trust. If your heart is still set on using pods to increase your engagement, you should probably join a few smaller pods first if you have a smaller following. Niche pods are also great to get interaction from users who share your interests and expertise, making their engagement look more authentic. Furthermore, the engagement that you will get is not necessarily meaningful. While you might have a ton of new followers and likes, they will be from the same group of people who are in you pod, which means it won't be from people who actually enjoy and engage with your content in a meaningful way. In other words, the thousands of likes, despite boosting your engagement, might give you a false idea of what works and what doesn't for your profile. It can also be extremely time consuming to be part of a pod and the bigger the pod, the more time it will take to engage with members' content. After all, you can't expect people to like your posts, but you don't return the favour. Most pods are very strict about this. 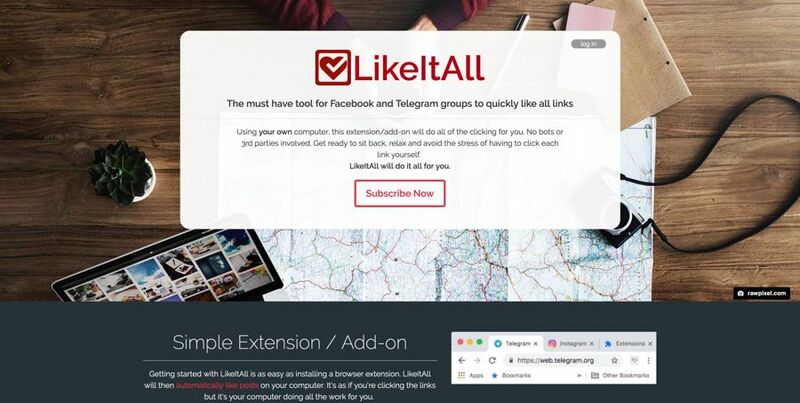 There are apps such as LikeItAll which can automate your work and will go and like every link posted on your group, so you don't have to do it manually. If you don't have all day to be on Instagram, this could be worth looking into. For brands, the stakes are even higher when deciding to use Instagram pods. While the interaction from your pods may boost your reach and engagement, it won't be from the right people – potential customers. The users in your pod won't like your content because they really like it, but because they get something out of it for themselves. While it might boost your profile to be more visible, it's unlikely that a potential customer that has never come across your profile will now do so. Where brands might find good use for Instagram pods is when they are looking for influencers to work with. If an influencer uses pods to inflate their number of followers or popularity, you might want to reconsider working with them as you won't be getting the appropriate value for your money. It's possible to spot this by looking closely at their content and whether they had a sudden spike in engagement sometime, as well as the ratio of their followers to their likes. While there are certainly downsides to joining an Instagram pods (not to mention that it could be considered fraud to inflate your engagement numbers to earn money) there is definitely something to be said for joining certain pods. Niche pods can be especially helpful if you are a new or small brand or influencer looking at new ways to connect and build your audience. If you're an Instagram enthusiast and genuinely looking for ways to meet and engage with new content and people it's definitely worth a try.